NUSKY Nusky first became known for his talent as an actor, then arrived late to rap. Better, he started rapping even before listening, amused by the challenge it represented and by his childhood friends who had already taken the plunge. If the rap is then in full celebration of old-school with the advent of the group 1995, Nusky already has other desires. After playing guitar and singing in a rock band, the Young Thug fan became known through his duet with beatmaker Vaati. 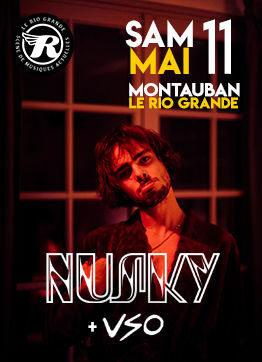 But whether he's playing as a band or solo, Nusky always evolves at the crossroads of several influences that make him an artist apart on the French rap scene. VSO VSO is a trio from Nîmes, formed in 2014. The group offers a hip-hop music complete and modern, with rock'n'roll and electro inspirations. Going to find harmonies in the four corners of the cosmos, VSO takes you on an exciting and energetic trip. Explosives on stage and behind the scenes, cut for the live, they propose a detonating show, badly contagious.